Enjoy a 2 Days Bwindi Gorilla Trekking Safari in forests of Bwindi Impenetrable National Park. Bwindi forest is a habitat of Mountain Gorillas in Uganda. 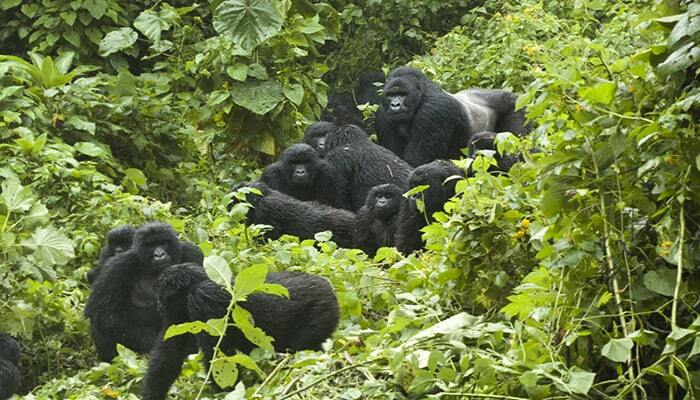 This is one of the budget gorilla trekking tours in Uganda because of its short nature. Day 1: Pick up from Kigali Airport or a Lodge in Rwanda to begin a 2 Days Bwindi Gorilla Trekking. Your driver guide will pick you from Kigali International Airport or at hotel in Kigali to begin a gorilla tour to Bwindi Impenetrable National Park. The charming journey will take you from a tiny country of 1000 Hills to Uganda, the Pearl of Africa, gifted by nature. You will cross to Uganda via Cyanika or Katuna boarder post. You will drive straight to the gorilla park. Check in at your lodge, have lunch and take a rest. Dinner and overnight at Gorilla Safari Lodge, Gorilla Mist Camp or Bakiga Lodge. When done with breakfast, you will transfer to the park headquarters to get a gorilla trekking briefing. Your knowledgeable guide will take you through all the rules and regulations to follow while with your hosts, the gorillas. When every visitor is given a family to trek, your driver will transfer you to the hiking starting point. Based on your physical fitness, age and preferences, you will be attached to a gorilla group within your interest. Kindly tell your guide about your likes and dislikes so that he bargains for a gorilla family that may meet your tastes and favorites. Physical fitness is key to enjoying the trekking undertaking. The hiking exercise may last between 1 to 8 hours, meaning trekkers should expect returning early or late. During the tracking excursion, you guide will explaining to you about other wildlife species including plants, birds and animals. Feel free to ask questions of your choice for your deeper understanding. The climax of the adventure is when come across the long-sought gentle giants of impenetrable forest. There is always a high degree of inquisitiveness, imagination and eagerness that feature your mind as you’re your guide tells to lower your voices as you are about to reach the primates. Joy and happiness characterize the moment. Staying round the midst of the gorillas you have always visualized is worth your trip energies. For the one hour you are with the gorillas, critical observations and photographing are allowed. Your gorilla visit ends after an hour when the guide asks you to prepare to leave back to the park headquarters where you will you’re your trekking certificate. You will then leave for Kigali with an en route lunch in either Kabale or Kisoro town depending on the border point you exit through. On reaching Kigali, your driver may drop you at a hotel or the airport as per your programme. End of Bwindi Gorilla Trekking.